I've borrowed the title from a 1967 Beatles song, which featured on the "Magical Mystery Tour" L.P. However this has nothing to do with music - unless the magical mystery that is the world of steam toys is music to your ears! Firstly then, HELLO. It is always good to find that good quality steam toys are continuing to be made. Film companies often capitalise on marketing a huge range of products related to their latest releases. Those of you with children or grandchildren, will no doubt be familiar with the fact that, little Johnnie or his sister must have the latest Disney related toy. 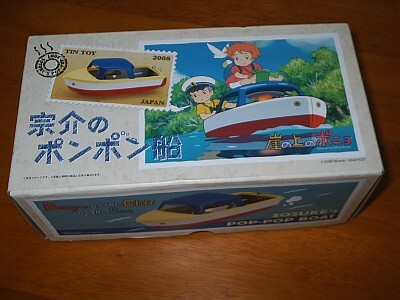 As a collector of steam driven "pop pop boats", I was amazed and delighted that a Japanese toy manufacturer, Ensky Co Ltd, had released a quality pop pop boat, to coincide with the release of a film. The film in question is a 2008 animated offering from director Hayao Miyazaki and is called "Ponyo on the Cliff by the Sea". The boat (see above) is approx. 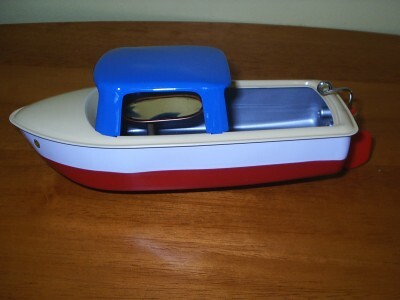 8" (20cm) long, and is of sturdy metal construction, with the exception of a plastic rudder all being very well finished. It also has a well designed burner tray and comes with a priming pipette and a supply of candles. An attractive presentation box (see below) completes what is a very welcome addition to my collection and encourages me that good quality items are still being made. Aimed at the Japanese market, some examples are finding their way on to Far Eastern ebay listings. They cost in the region of £50. Secondly GOODBYE. In the Winter 2007 issue of "STEAM" I wrote an article extolling the virtues and products of a German tin toy company, Tucher & Walther. They have been in business since 1977, making a range of hand made tin toys including steam powered ones. 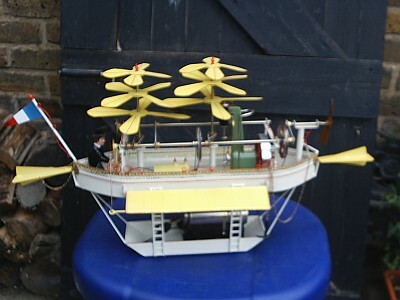 The pride of my collection is the "Flying Boat" (see above), powered by a Wilesco steam engine, note not a pop pop boat! 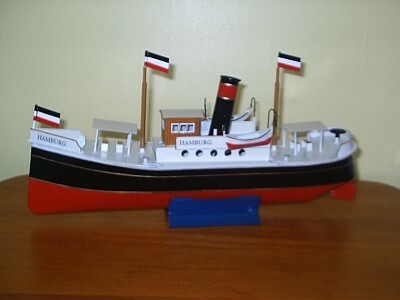 Oh and here is one of their pop pop boats, the "Hamburg" (see below). Sadly, I recently received news that Mr Tucher plans to retire and has not been successful at finding an artisan, such as himself, to continue the business. So, it looks as though 2009 will be their last year of business. So, like those old jokes, I've given you the good news first and then the bad news. Long live quality steam powered toys!